Please welcome Lauren M. Roy back to the blog. 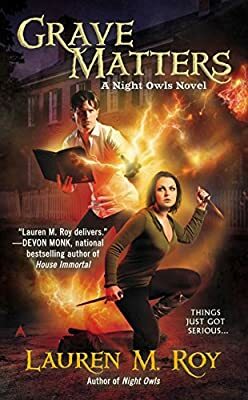 She stopped by to talk about Grave Matters, the 2nd book in her Night Owls series, and we’ve also got a giveaway, courtesy of the nice folks at Ace! What can we expect from Elly and the gang in Grave Matters, the followup to Night Owls? The dead in Edgewood aren’t staying dead, and the crew is trying to figure out what – or who – is causing it. 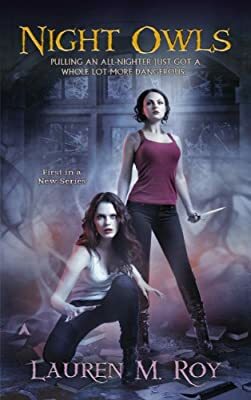 Meanwhile, Elly’s working for Ivanov, and finds herself involved in a turf war between Ivanov’s Stregoi and a new group of vampires in Boston. Not only are they dealing with problems on the supernatural front, they’re also all figuring out how to relate to one another in their everyday lives. The events of Night Owls brought big changes for Elly and Cavale. Val’s got herself a new vampire protégé, and Chaz is wondering where he fits in among all these badasses. Also, we get a new point of view – Cavale’s! How do you think your characters have grown the most since the first book? In the first book, the characters were in crisis mode a lot. Now that they’ve had some down time (and a few Sunday dinners at Sunny and Lia’s) they’re getting a feel for the group’s changing dynamic. While I was writing Grave Matters, I felt like they had a bit more brain space to be introspective, and it was nice to let that play out a bit. Val’s dealing with her long-ago decision to quit hunting. Chaz doesn’t like feeling like the weakest link, and Cavale’s trying not to upset the delicate balance he and Elly have struck. Out of all of them, I’d say Elly’s grown the most. The person she trusted most in the world is dead, and she keeps waiting for the Night Owls crew to tell her to hit the road – especially Cavale. When she first arrived in Edgewood, her instincts had her ready to slip out into the night at a moment’s notice. She’s overcome that, to a point, and is trying to find her place in among these people who seem to actually want her around. I have a lot of fun winding the characters up and watching them go. If I’m able to make myself giggle, cringe, or on occasion get all sniffly while I’m writing their interactions, hopefully some of those moments will evoke the same reaction from readers. It’s been a while since we’ve caught up. Have you read any good books lately? Is there anything you’re particularly looking forward to this year? Oh my yes. I’m almost always in the middle of two or three books, so right now I’m loving Hild by Nicola Griffith and Karen Memory by Elizabeth Bear. Next up on the list are Half-Resurrection Blues by Daniel José Older and The Three-Body Problem by Cixin Liu. For upcoming books, I’m making grabby hands at Fran Wilde’s Updraft, Aliette de Bodard’s The House of Shattered Wings, Camille Griep’s Letters to Zell, and Fonda Lee’s Zeroboxer. I’m also super excited for my friend Hillary Monahan, who’s writing as Eva Darrows for The Awesome. What’s something that you know now that you wish you’d known when you first got published? Set aside time that is specifically dedicated to your writing. This can be every day, or a few times a week, or even one good stretch on a weekend. That is your time to sit at your keyboard and get words down. Schedule it in the same way you’d treat a recurring meeting at work, or a class you were taking, or an extra-curricular activity, and give it that same commitment. Let your family and friends know that this block of time is for you, and ask them to respect it. Some days, life’s going to throw stuff at you that tears you away. As soon as you can get back to that schedule, do it. Keep that appointment until you finish your story. Then keep it the next day, and start a new one. Next up is The Fire Children, a YA fantasy coming out June 30th from Ravenstone. Early ARCs just went out, so I’m at the nailbiting phase, knowing it’s in people’s hands and they’re travelling the streets of Kaladim with my heroine Yulla and a boy made of fire. Want to win a copy of Grave Matters (US only)? Fill out the widget below, and I’ll pick a winner on or around the 8th. giveaway, Grave Matters, interview, lauren m roy. I’ve got the first book in this series on hold at my local library and I’m waiting for it to come in. I’m looking forward to getting into this series and maybe even winning a copy for my home library.